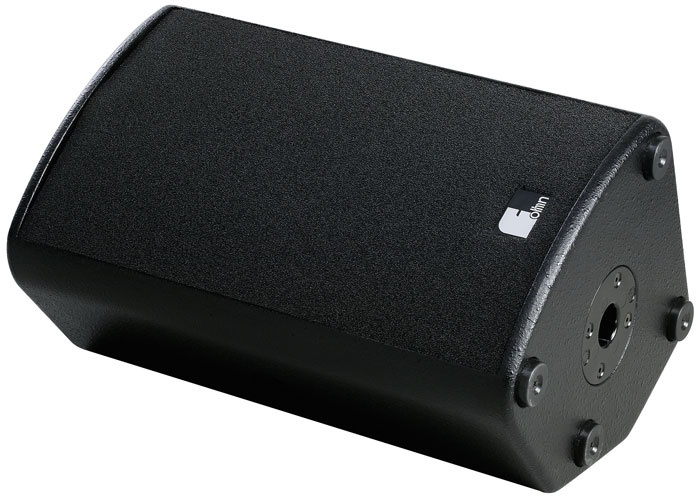 This premium German-made PA aims to offer a genuine hi-fi approach to live sound reproduction. But is it worth the investment? Ever since I reviewed a medium-sized Fohhn PA system, testing it out on a fairly large outdoor event (see the November 2004 issue of SOS Live), I've been a big fan of the company's approach to sound reproduction. While Fohhn PAs are by no means the cheapest systems around, they manage to sound more 'hi-fi' than most other PAs, yet they're also relatively compact and light. The Xperience II system represents the smaller end of the Fohhn range but it still packs enough power for smaller band gigs, gigs using full-range backing tracks and discerning acoustic acts. One of my tests was at a fairly loud dance-music gig in a marquee, and although I eventually hit the limiters the level and quality of sound really surprised me. Even more impressive is the fact that the entire system will pack into the back of most small hatchbacks, even without the rear seats folded down. The basic Xperience II system comprises two passive TOP XT2 speakers and one SUB XS2 powered subwoofer. All the crossovers are passive networks, both within the top cabinets and between the sub and the tops, and the crossover in the top cabinets includes a three-stage tweeter-protection system. A pair of Class-D 500W power amplifiers is built into the sub and these power everything, with DSP (Digital Signal Processing) technology handling EQ and limiting. It's also possible to add two further top speakers and one more passive sub without needing to bring in more amplifier power but, unusually, the system can utilise the full 500W per channel even when working with only one sub and two top cabinets. How the Fohhn designers have achieved this is something of a technical secret, as is the means by which they feed a single voice-coil sub with a mono signal derived from the left and right channels using passive crossovers. This powered passive approach is a departure from the active speaker norm, where every driver has its own amplifier and active crossover, but it certainly works. Multi-band DSP is built into the sub, to maintain optimum tonal balance at all listening levels and also to provide anti-clip limiting. I asked for more information on this aspect of the system and was told that the DSP provides three-band limiting to cover the frequency ranges of the bass speaker, the mid driver and the HF driver, and ensure that each speaker receives only as much power as it can handle safely. The DSP, which also includes equalisation to optimise the system sound, is claimed by the manufacturers to be the technical equal of the big-name external processors using in large touring rigs. It modifies the system's frequency-response curve depending on the level of the PA, so the tonal balance remains correct whether at a loud gig or a wine bar. As far as I can see, this exploits the way in which the human hearing system responds to different sound levels: boosting the highs and lows at lower listening levels helps maintain a sense of loudness and power. As the system level is increased, this EQ function flattens out to become linear. The SUB XS2 is really the heart of the system but it is surprisingly compact, being based around a single 12-inch, Neodymium, long-throw driver mounted in a vented cabinet built from high-quality birch ply with sensibly placed carrying handles. Measuring just 43 x 39 x 44cm, the sub weighs a very manageable 19kg, partly due to the use of modern Neodymium technology and partly to that of Class-D amplifiers. During the trials, I carried it a considerable distance in one hand with one of the tops in the other, something I definitely couldn't do with my own Mackie system. The subwoofer is the business end of the Xperience II system, containing a pair of 500W amplifiers and the DSP for EQ and limiting. The rear panel of the sub features all inputs and outputs, Powercon mains power inlet and power switch, ground-lift switch, and LEDs to show signal presence/clipping and whether speaker protection has kicked in.All the connections are on the rear panel: Speakons for the feeds to the other speakers and XLR/jack combi sockets for the stereo line inputs. A Powercon cable is used for the mains feed, which has the advantage of being locking, but if you forget to pack it you're less likely to be able to drum up a spare at short notice than with an IEC cable. The fact that the connector is a locking one is a double-edged sword, too: the cable won't get dislodged during a performance, but if someone trips over the cable, the plug can't come out, meaning that the cable itself might get damaged, or even pulled out of the plug. Because Class-D amplifiers are so efficient (around 95 percent), the rear panel serves as an adequate heatsink, and even the amps run surprisingly cool, at a maximum of only 14 degrees centigrade above the ambient room temperature. A single rotary control sets the relative subwoofer level, with the centre position being nominally flat. A slide switch moves from mono to stereo operation: normally the system is run in stereo, but if you were using two systems you could run both in mono mode and have one for each channel. A threaded pole-mount is fitted into the top of the sub and a mounting pole is included, to support one of the top speakers. The other speaker mounts on a conventional stand, unless you add a second passive sub, in which case the second speaker can be pole-mounted above that. Although they're deceptively compact, at 32 x 51 x 29 cms, the 8Ω TOP XT2s have a power rating of 300W each, with a short-term peak-handling capacity of 600W. These are two-way speakers comprising a 10-inch woofer teamed with a one-inch, constant-directivity, horn-loaded HF driver. The two drivers are time-aligned for phase accuracy and are very efficient, being quoted at 99dB (1 Watt at 1 metre). They can generate a maximum SPL of 127dB, with a coverage angle of 90 degrees horizontally and 40 degrees vertically, and since their frequency range is 65Hz to 20kHz they could work as a part of a vocal system without the sub (whose frequency response extends from 38 to 130Hz), providing they were teamed with a suitable power amplifier. They also have an angled enclosure (55 degrees), allowing them to be used as stage monitors, and may also be used as side-fill monitors. Again, they're made of plywood, finished with a very durable textured black paint, and are virtually resonance free. Weighing just 15kg each, they're built like tanks, with a metal protective speaker grille topped with a thin layer of acoustically transparent foam. Carrying handles are built in, as are fly mounts, and there's a standard pole-mount socket in the base. Each TOP XT2 has two Speakon connectors on its recessed connector panel, to facilitate daisy-chaining to a second cabinet where required. Optional protective covers are available for both the tops and the sub. Class-D amplifier: A Class–D amplifier is one in which the output transistors are operated, effectively, as switches, being either fully off or fully on, with the audio signal modulating (controlling) the switching action. A Class-D amplifier design is very efficient, allowing smaller power supplies to be used. The 'D' is sometimes mistakenly said to stand for 'digital' when in fact it was simply the next letter in the alphabetical series after Class A, Class B (and A/B) and Class C.
Crossover: A crossover is an electronic circuit designed to separate high– and low–frequency signals from each other so that each can be fed to speakers that are properly optimised for the role — ie. large, robust speakers for bass, and small and light (and therefore fast) speakers for high frequencies. If a crossover is placed between the power amps and the speakers (usually built into the speakers), it is said to be 'passive'. An 'active' crossover is used to divide signals before the power amps, so separate amps are then used for each band, further adding to efficiency. Crossovers can be two–way, simply splitting highs and lows; three–way, adding a mid band; and ocasionally four–way. Neodymium: Very high strength 'rare–earth' magnet type made out of neodymium, iron and boron. Its use in a loudspeaker allows the coil attached to the diaphragm to be made smaller and therefore lighter, thereby increasing the speaker's efficiency. SPL: Sound level calculated in decibels compared to a reference sound pressure, commonly 20 micropascal (20 uPa), defined as the threshold of human hearing (0dB SPL). The human ear is capable of hearing an enormous range of sound pressures — the ratio of the sound pressure from the minimum up to damaging levels from even short–term exposure is more than a million — necessitating a logarithmic scale, which also corresponds roughly to our psychological perception of loudness. Time-aligned: When any part of an audio signal is reproduced by more than one drive unit in a cabinet, any difference in the time taken for the audio to reach the listener from each source, due to the different positions of the drivers, will inevitably degrade the sound. Designers seek to nullify this effect either by physical alignment, such as sloped or stepped baffles, or through electronically delaying the signal to the driver with the shorter path length to the listener's ears. I found the Xperience II system very portable and quick to set up. It also has a soft-start, switch-mode power supply, so that there's no switch-on thump. As soon as the power has come up to the required level, green LEDs on each channel (on the rear of the subwoofer) show that the system is ready to use. These are dual-colour LEDs, which also flash red when the limiter is active. If anything happens that puts the amplifiers into self-protect mode, such as a speaker-cable short circuit, red LEDs show on the affected channels. However, there are no visible limit LEDs on the front of the system, where the front-of-house engineer could see them. For situations where ground-loop hum is a problem, there's also a ground-lift switch, although I found no need to use this, as everything was perfectly quiet. As you'd expect, an angled shape allows the top cabinets to be used as stage monitors. The maximum level achievable by this system is just a few dBs short of what I get from my Mackie system. When you consider how much smaller the Fohhn system is, that's pretty impressive. It doesn't have quite the same depth of bass, but it still has enough to deal with even quite punchy material in small to medium-sized venues. Part of my test was running full-range backing tracks through the system, and the only time I've ever heard these sound better was when I was mixing them on studio monitors! Most PA systems do a pretty perfunctory job on recorded music, with the mid-range often being particularly weak, but the Xperience II system behaves more like a loud hi-fi system, providing a clear and crisp mid-range with plenty of transient detail. The real test, at the local pub open-stage night, confirmed the system's credentials. It was brought in and set up in just a few minutes, after which it handled a number of acts, including solo singer/guitarists, acts with backing tracks and recorded background music. Not only did it sound clean and articulate, it also showed better-than-average resistance to acoustic feedback. At very low levels, the sound is brighter and tighter than you'd normally expect, no doubt due to the on-board DSP equalisation, but it doesn't sound unnaturally hyped, and the effect isn't so strong that it has you reaching for your mixer EQ. On the contrary, I found that most signals sounded best mixed flat, including the vocal mics. In fact, the only shortcoming I found was that because the system has no input-level control, you sometimes have to drive your mixer fairly hard to get enough level in. I remember this being an issue with the larger system I tested last year, so it's important to use a mixer that has +4dBu outputs, as the consumer -10dBu level may not drive the system adequately hard. 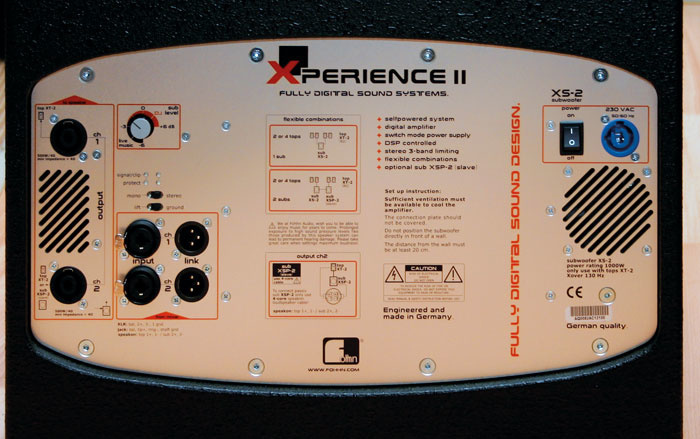 As a compact system capable of producing hi-fi like audio in smaller venues, the Xperience II is very hard to fault. Acoustic music comes over with pristine clarity and vocals sound as natural as you could hope for, with great intelligibility. I'm impressed at the way the system can be expanded using additional passive boxes: although this particular system is probably too small for bands who want to mic their drums and DI their bass (except in small venues), it can be expanded by adding more tops and/or another passive sub, to add up to another 6dB to the overall level. And if you need more volume or more depth of bass, Fohhn produce a range of sound systems, of which this is probably the smallest. The Xperience II system is also a joy to transport and to set up, but all these positive attributes come at a price. Because of its not inconsiderable cost, my guess is that the Xperience II would be best suited to club and pub performers who are working regularly and need to combine the best possible sound quality with ease of transportation. It's also ideal for acoustic bands who need a bit more up-front level, or acts using good-quality backing tracks or sequences. Similarly, electronic acts working smaller venues will find that the Xperience II can recreate the sound achieved in their studio recordings very accurately, and with enough low end to do justice to almost any type of material. Classy, almost hi-fi sound quality. Accessories such as covers, cables and stands are optional. If you just want to generate enough SPL, there are far cheaper ways of doing it than with an Xperience II PA, but as a system capable of delivering near studio-quality reproduction in a compact and lightweight package, I've yet to try anything that comes close to it. 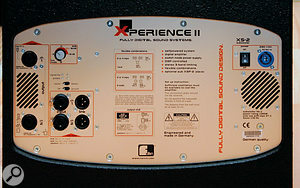 Xperience II System £2846; Xperience II Power System (two subs and two tops) £3423. Prices include VAT. Systems Workshop +44 (0)1691 658550.